Dontaie Allen says he didn’t play any differently this summer. Instead, he just had adjust to showcase his skills on a bigger stage. 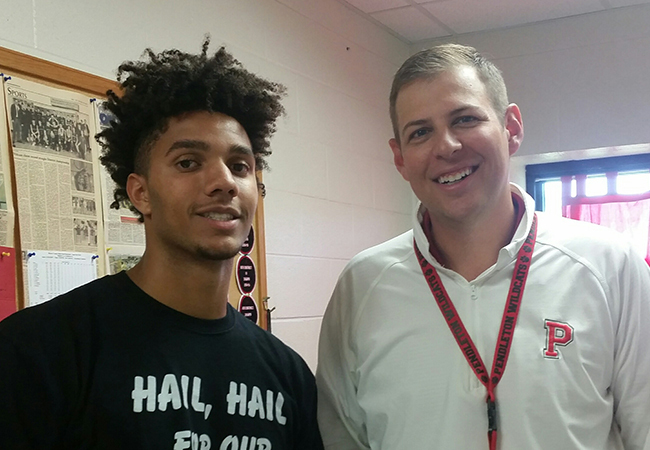 Kentucky signee Dontaie Allen with Pendleton County coach Keaton Belcher. Photo by Larry Vaught. He was already a celebrity of sorts in Pendleton County before he received a scholarship offer from Kentucky and quickly decided he wanted to play for coach John Calipari. Now senior Dontaie Allen is really a celebrity. “Pretty much everywhere I go people recognize me and will ask about the situation (with Kentucky) and how things are going with it. I really enjoy it. It gives me something to talk about because almost everybody around here loves Kentucky and is thrilled I am going to Kentucky,” said Allen. It’s almost like a fairy tale story how he’s gone from a “not very good” basketball player as a kid to a future player at his dream school — and the school that had more players on opening day NBA rosters than any other school in the country. He averaged 31.8 points and 11.4 rebounds per game last season when he shot 59.1 percent from the field, including 40 percent from 3-point range. He went into his senior season with 2,697 points, including two 50-point games, and 1,044 rebounds. He’s had 56 double-doubles in 105 high school games. 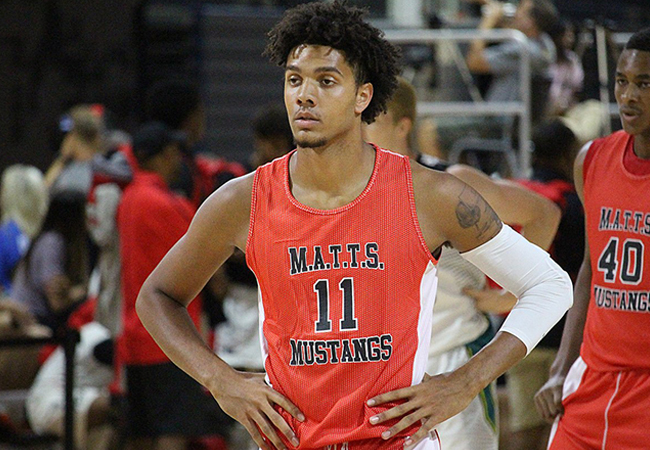 Still, his recruitment did not blow up until last summer when he was playing AAU for M.A.T.T.S. Mustangs and had over 20 scholarship offers before the one from Kentucky came. “I am just really glad it happened. I feel like I have always done those things I was doing this summer. It was just the platform that I did it in. I did it against some of the nation’s top talent,” Allen said. He stayed so focused that the first time Calipari came to see him play during an event in Georgia, he didn’t even know the coach was there until the game ended. He scored 30 points that game. Calipari’s first phone call to Allen didn’t exactly go well, either. Allen didn’t answer. Allen made an unofficial visit to UK a few weeks later. He had no scholarship offer at the time, but he got one during his visit. His high school coach, Keaton Belcher, thought the offer might be coming but anticipated Allen not rushing to make a decision. Allen had even told his parents, April and Tony, before the visit he didn’t know what he would do if he got a scholarship offer. Belcher says, Allen is a special talent on the basketball court but also a rare person off the court.